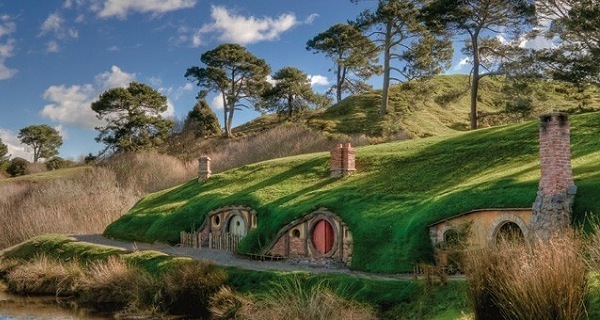 Explore Middle Earth with this 15-day/12-night vacation on the bucket list of every “Lord of the Rings” fan! Start your journey in the harbor city of Auckland and spend two days exploring here before moving onto the Hobbiton Movie Set in Matamata. Take a guided tour of this remarkable film set, get lost among the Hobbit-holes, visit the Green Dragon Inn, the mill and the Party Tree and listen to spell-binding tales of how Hobbiton came to be. 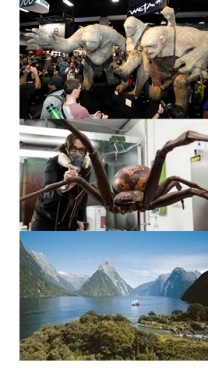 Discover the Weta Workshop, world renowned for creating incredible movie props and practical effects. Handle movie replicas of Aragorn’s Sword, Gimli’s Axe, Eowyn’s Sword, Gandalf’s Staff, the Flag of Rohan and a map of Middle Earth. See and learn about the creative process from start to finish and relive the magic of countless movies. Visit a working set and watch episodes of “Thunderbirds Are Go” being filmed right before your eyes! See Mount Sunday, the peaceful mountain that was transformed into Edoras and immerse yourself the natural unspoiled beauty of the high country. Take in the breathtaking 360 degree views of rivers, lakes and mountains including the Misty Mountains and the area that formed the backdrop to Helms Deep. Enjoy more film locations including those used for X-Men Origins: Wolverine, and The Chronicles of Narnia. This fantastic excursion includes round-trip airfare on Air New Zealand from Los Angeles or San Francisco to Auckland; Wellington to Christchurch and return to Queenstown; twelve nights accommodations; Hobbiton, Weta Workshop, and “Thunderbirds Are Go” set tours: Maori Cultural Experience & Hangi Dinner and the Milford Sound Nature Cruise. Transfers, taxes plus five days rental car (Auckland to Wellington) included. Prices start at $5,099 per person, based on double occupancy. Rates vary based on season. Auckland is the ‘City of Sails’ and offers an amazing selection of activities from high-speed America’s Cup yacht racing to a casual cruise on the harbor. Beyond the city you will find islands like Waiheke, known for their local artists and wineries! Queenstown is New Zealand’s outdoor adventure playground offering jet-boating, bungy jumping, and heli-skiing set against a stunning backdrop of lake and mountains. Dive deeper into Auckland’s museums, galleries, zoos and parks. Swim with sharks or stingrays at Kelly Tarlton’s Antarctic Encounter or see a collection of intriguing artifacts showcasing New Zealand’s history and culture at the Auckland Museum. Then travel south to Rotorua to experience Maori culture, and on to Wellington, the capital of New Zealand, where you can ride the historic Cable Car to visit the Botanic Garden. Finish in Queenstown, of an area of extraordinary natural beauty and many fun-filled, action type activities (jetboat rides, white water rafting). Queenstown has it all! Enjoy five nights in the stunning Cook Islands. With exotic white sandy beaches, tropical lagoon water lapping at your feet and the sun setting over the mountains, the Cook Islands offers the perfect vacation experience. Continue to Auckland, a city that offers New Zealand’s best shopping and dining experiences, along with a beautiful harbor. Experience Maori culture, an integral part of Kiwi life, with the Auckland Maori Tour, where you will hear stories of the Maori people, and learn about their language and heritage. Then its on through the mountains of the majestic Southern Alps to the sand dunes, reefs and surf of the rugged West Coast.